Posted March 18, 2007 @ 9:25 am - Filed under: Misc. 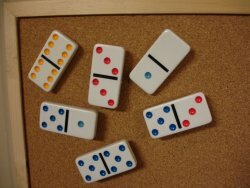 I’m always surprised at the fun, interesting, and endlessly creative uses people can find for dominoes in the world of arts and crafts. 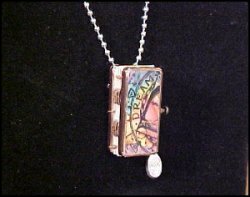 Our Domino Art page is one of our most popular pages here, so others must agree. Posted January 28, 2007 @ 6:17 pm - Filed under: Misc. 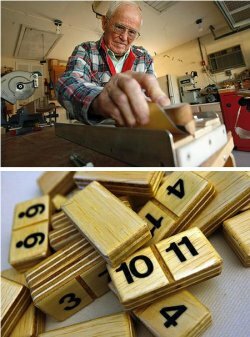 Paul Smith of Naples, Florida is an 85-year-old woodworker who’s been making domino sets for about 18 years. 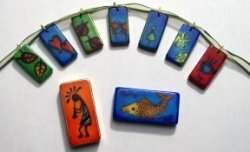 He makes them as a hobby, but sells them through word of mouth to people from around the world. 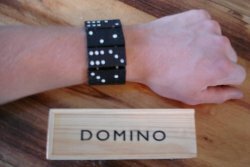 In an article in the Naples Daily News (The man who fell for dominoes), staff writer Liam Dillon reports that Smith makes his dominoes out of thick cabinet-grade plywood, and uses large numerals instead of dots, to make them easy to read for everyone from children to adults. The dominoes are sealed with polyurethane to create a smooth and long-lasting surface. Smith makes double-twelve sets consisting of 91 tiles. He sells a completed set for $40 plus shipping, and says they’re very popular both in his local community and with “snowbirds” who winter in southern Florida. He estimates that it takes him about nineteen hours to make one set from start to finish, using his garage-based woodworking shop, and he’s had to enlist the help of his wife of 61 years, Ches, to help keep up with production. “He used to do all of the work himself, but since he’s gotten so many orders, he needed help,” she said. He advertises his game as “Turkey Foot”, which Ches said is a little more challenging than Chicken Foot. The full article includes much more information about Paul and Ches, as well as some additional photos and a short video. Posted May 25, 2006 @ 7:29 am - Filed under: Misc. 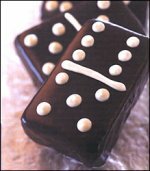 Here’s something I never would have thought of, but it’s a great idea: Next time you’re having friends over for a domino party, how about serving them some domino-themed treats? Image courtesy of Global Gourmet. Domino-Games.com > News > Misc.